If Gove Really Was Going Back To The 1940s…. When Rab Butler was summoned by Churchill to be informed of his new position as President of the Board of Education, Churchill was typically forthright. Am now getting near the end of Rab Butler’s autobiography. The later chapters mostly cover his time as Chancellor and working in the Home and Foreign office. The chapter on his role as Education Minister retold his involvement in the 1944 Education Act and I thought it was worth recounting that process because of the insight it gives into the passing of education bills. The 1944 Education Act is considered one of the most significant education reforms of the 20th century. But it was not supposed to be this way. Eight years earlier the 1936 Education Act laid down the same law now associated with the ’44 act: that every child should remain in school until aged 15. With a three year lead-in period the policy was due to start on 1st September 1939. On that day, Germany invaded Poland. The perils of war rained hard on the education system. Evacuation, loss of male teachers, the use of school buildings for war ministries, all meant countless interruption. Educational operations could at best be called ‘hazy’ during this time. The poverty and lack of literacy among the inner-city children bundled off to the doorsteps of the wealthier also brought a growing awareness of England’s educational inequalities. Not for the first time education became the rally cry for anyone who wanted to improve these children’s futures, and so it was that Butler was handed the job of preparing for a better situation once the war was won. [The idea that England would not be the ultimate victors appears never to have entered Butler’s mind]. In June 1941 he published “The Green Book” – a plan for a ‘multilateral’ schooling system that would abolish ‘extreme inequality of wealth and possessions’. The NUT responded with their own “Dark Green Book” and the Directors and Secretaries Association published an “Orange Book” giving their views on the matter. Coloured books were clearly the blogging of its day. More inclined than later secretaries to listen, Butler took the books seriously and attempted to move his position. Unfortunately, not everyone was pleased by his actions. 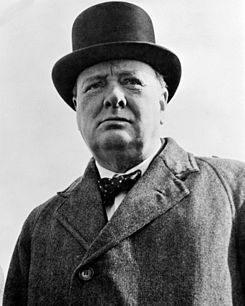 Churchill sent a letter on the 13th September 1941 stating: “I certainly cannot contemplate a new Education Bill.“ Churchill was concerned that any quality education system threatening private schools would be a distraction right at the time he needed the elites most. He was probably right. Butler henceforth laid off the public schools (he had previously suggested integrating them) but continued writing his Bill. A thornier problem was that of the ‘provided’ and ‘non-provided’ schools. In the 19th century most schools were operated by voluntary bodies who raised money from public subscriptions. From 1833 the State also provided funds to ‘assist’ the schools. By the early 1900s the largest voluntary provider, the Church of England, educated nearly two million children. However, two and a half million were also by this point educated in local government schools. If church schools needed money for new buildings, or to pay more teachers, they were given money by the state, however attending religious school was only possible if you of that faith. Taxpayers then asked: Why should the state fund schools that our child (of a different religion) cannot attend? [That it took England so long to become annoyed by this is fascinating; America had a similar debate a hundred years previously]. The debate had rumbled on, but by the 1940s Church of England schools were now the ones most in need of repair. Many had too few pupils to be economical. And the discriminatory policies the schools had towards teachers, often underpinned by racist tendencies, irked the NUT. Butler knew that in a post-WWII world, where money was tight and needs high, handing over cash for the necessary repairs to CoE schools considered discriminatory and elitist was going to split spleens. The Roman Catholic church, however, was less concilliatory. They called the new curriculum ‘Disembodied Christianity’ and argued they had not spent millions building schools in the 19th century to simply hand them over to the council. It was a fair point. Butler’s next compromise bestowed two new phrases on our educational landscape. He offered Church schooles the choice of becoming either ‘controlled’ or ‘aided’. If ‘controlled’ the LEA would be responsible for all the school’s costs, the appointment of teachers, and the children would be taught the ‘County Council Creed’. If a religious school chose the ‘aided’ path then the LEA was responsible for teacher salaries and the running of the school, but managers were responsible for alterations to bring the building up to standard. On the plus side aided schools could hire and fire all teachers at will, and could teach religion as they wished. Still, the churches would not play nicely. At least, not until Butler revealed the hard facts. Over 90% of Church Schools were 40+ years old and the Church simply did not have enough money for their upkeep. They, and Rab, knew it. Butler’s deal was a solid one: the ones who shifted to the LEA got their curriculum and retained choice over their leaders but the building costs were sucked up by the LEA who could quell the baying crowds by explaining that they now had control over recruitment, admissions, etc. All was exciting and the passing of the Act finally looked assured. It was only then that Butler got a phone call. He had finally – after years of waiting – been considered for the role of Viceroy to India, his dream job, and was asked if he might wish to take it?